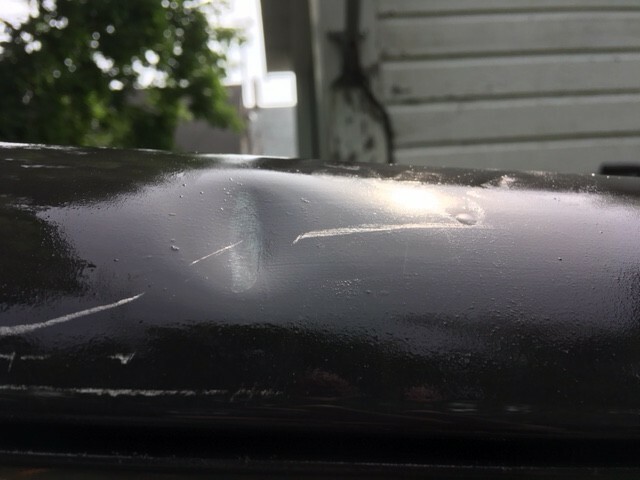 Hobie Forums • View topic - Is this small dent in the mast OK? Is this small dent in the mast OK? Post subject: Is this small dent in the mast OK? I was rigging my boat Sunday and noticed this dent in the mast. Don't remember that being there last year, but not sure when it happened. It's probably about ans inch or inch and half long. I took a close up picture and one further away so you can see where it is in relation to the mast head. Thanks for looking. 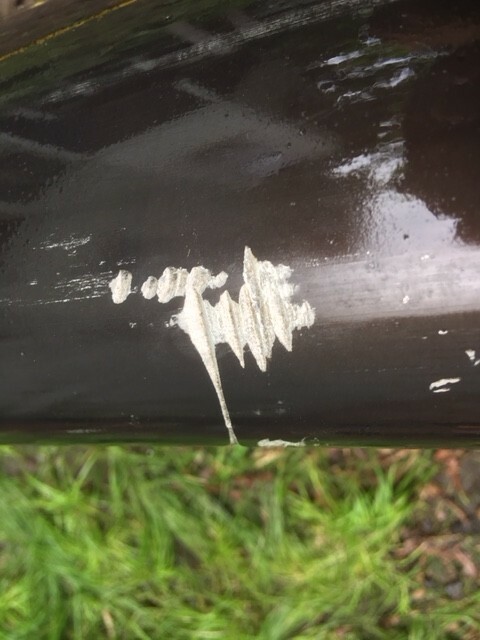 Post subject: Re: Is this small dent in the mast OK? No, it's not OK. It isn't small and it is in a bad spot-especially if you fly a spin. 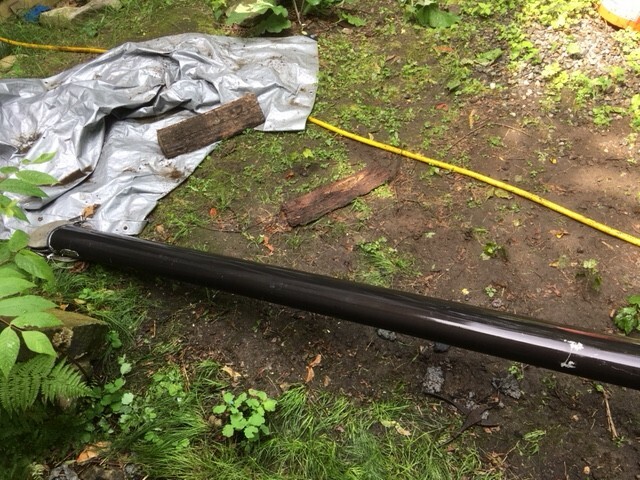 I have a second mast but it has some deep scratches/gouges in it that I am worried about. When I bought the boat it came with two masts and I have never used this one. Here is a close up and a zoomed out picture of this one. Spinnaker would attach below that point (at the hounds) so it wouldn't be an issue. And because the dent is so far above the hounds, very close to the mast top, it isn't likely to cause any issues otherwise. But having said this, I'd start looking around for another mast regardless. Depending on the conditions you sail in, I might be uncomfortable with a dent anywhere in my mast. Another thing to consider is what happens if the mast does bend or buckle at that point. Not sure - seems less catastrophic than failure low down. Well, since you have two masts, both of them imperfect. You can sacrifice one to save the other by making a sleeve to cover the damage in the one you want to keep. Use bondo to fill the gouges if you want to use that one or pull some of the dent out, then fill the remaining dent with bondo. Cut a section from the mast you are sacrificing, cut off the mast track and file the outside edges. Use Sikaflex or 3M 5200 to bond the sleeve to the damaged area (hint, use plenty of masking tape above and below the damage to make clean up easier). Pop rivet the sleeve to the mast with staggered rows of pop rivets about 1.5-2" apart on both sides. Or you can get a new mast. Since the sleeve is adding weight aloft, you should get a new mast for sure if you are a racer. It is hard for me to tell how far above the tang (where shrouds attach) the gouges are, but you are likely OK. The dent is of little consequence, I would not hesitate to use the mast as is. Check the dent for cracks, as a leaky mast makes for a really rough day if you flip and it fills with water. The masts on hobie cats see bending loads, shear loads and compression loads. The max bending load occurs either slightly below the midpoint between the base and the tang, or just above the tang. As you move up from the tang the bending loads decrease quickly (roughly parabolic) and at the tip there is no bending. Applying this guesstimation formula to your dented mast, and assuming that the dent is 3/4 of the way to the tip from the tang, as much as 75% of your masts bending strength could be lost before the dent became a weakpoint relative to the highly stressed mast tang region. There are also shear and compression loads, but they don't really matter that much, at all... Seriously, bending freaking kills. Wall thickness = 0.078 +- 0.01"
Compare the depth of the scratches to the wall thickness... and make a guess??? Personally I prefer the dented one, since the dent is so close to the tip. Thanks for the great replies everyone. I am going to start looking for another mast but I will sail with the dented one in the mean time. I am going camping on an island in a lake tomorrow night so I will have to use it for that. The wind forecast is pretty light around 5MPH. I was thinking the same thing Leecea is, that if it did fail It would not be totally catastrophic, it would end the day but I don't think anyone will get hurt. I don't race yet and am not going to do any hard sailing just cruising until I find another mast. Thank you everyone. Looks like the dent is only about a foot away from the mast head. I think it will be fine. If the dent were in a different location (like the mid-point between the mast base and the tang), then I would be concerned. But all the way up at the top, it is unlikely to cause a problem. I'd sail it. Worst-case it buckles there and you sail/paddle back with a droopy head. I don't think something like that would dismast the boat. You might look at converting the mast to a comptip. It might be cheaper than a used mast (or if you can't find one), and certainly less than a new mast. Plus, the comptip-style masthead seems to be ever so slightly easier to raise the sail with, IMO. That might just be placebo. Thanks for all of the replies everyone. I can sail it for now without to much worries. The comp tip conversion sounds like a good option too. Where would I be able to buy the comp tip? Of course I will probably worry that I did not install it correctly and the tip will come off, Lol. 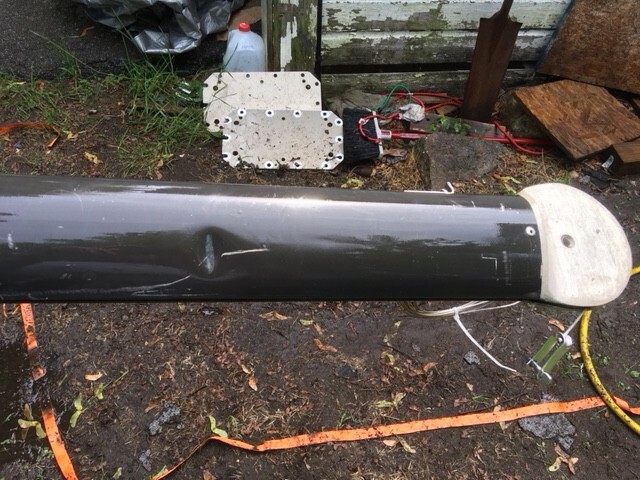 Just FYI, I just completed a repair in a dent very similar to that one on my mast (it fell at the dock due to an equipment failure and 20 kt crossbreeze). In any case it was straightforward. Drill a 3/16" hole opposite the dent and use a 3/16" rod to pound out the dent as much as possible. Take off the end cap and shove a short section of mast (without sail track) up to where the dent was. pop rivet (3/16") it in every 2 inches or so staggered in 2 rows. Good to go again. Takes an afternoon.